Leicestershire have not won in the County Championship for two full seasons. 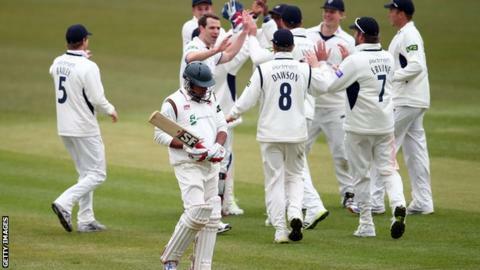 They rounded off the 2014 campaign on the wrong end of a thrashing by Derbyshire, and last won a four-day game in September 2012 - a run of 32 games. Chief executive Mike Siddall leaves on Tuesday with no full-time replacement yet appointed, and Shiv Thakor, Nathan Buck and Josh Cobb - three of their best young players - are also moving on. When was Leicestershire's last County Championship win? It came in September 2012, with the Foxes successfully chasing down a target of 236 to beat Gloucestershire by two wickets at Grace Road. said they were working "tirelessly to recruit new talent"
The first team's results were in sharp contrast to the second XI, who completed a treble this summer. So why are things seemingly going wrong on and off the field? Is it down to a shortage of ability, a lack of ambition, or a failure of leadership? Or is it a simple case of a lack of financial muscle? BBC Sport talked to past and present players, board members, and pundits and commentators to find out the reasons for the depressing run. "I'm very disappointed with what is happening but not totally surprised. When the two divisions came in I always warned that counties like Leicestershire would struggle. "They've got a Premier League football team and one of the best rugby teams in the country and a very small base beyond the city of Leicester as far as sponsorship and commerce is concerned. "Once you are labelled second division, once you cannot win the title, what chance have you got of attracting interest, sponsorship and top players? Why would young players want to stay there? Look at James Vince at Hampshire. Lots of people would love to see him playing for England, but he's a second division player. "What Leicester needs is to really connect with the Asian community. That's why I hope Wasim Khan, who has been at Chance to Shine for a very long time and has done an excellent job, should come to Leicester as chief executive. He knows how to connect with people. "There is a huge Asian community here that loves its cricket but there is a disconnect. I did an evening in Leicester with Sunil Gavaskar, who is mobbed wherever he goes as the father of Indian cricket. Only 200 turned up in a theatre that seats getting on for 2,000. That was despite countless marketing efforts to get the word out on the streets of Leicester. "There is a disconnect between the cricket club and the Asian community here, which should be top priority." "A lot of people would say it is all about money but I don't think that is right. I don't think money is the issue. The issue comes down to management. "This is all about leadership at the top level. It comes down to leadership, strategy and management. "If you look at the track record in the last two or three years, it has been appalling. And on the field is a reflection of what happens off it. You have to spend your money wisely. Some money will be wasted and you have to try and manage injuries, but you have to have a core group of senior players. "When the club is in the state it is in, there has to be a signal that there is a massive change and we are heading in a different direction. And you start - from that point - to attract players in. "The board have to look at themselves and say 'here is a plan' and the members can say 'yes we support you'. Or if the board have no credible plan, then they have to step aside." "We have had players who know they are staying, players that aren't sure, players that have signed trying to keep the group together. "When you get distractions off the field it makes a difference to how you perform on it and I don't think we have played with clear minds for the last months or so. "Clint McKay's signing is the first of hopefully more signings we will make in the near future. That's positive because that's rebuilding the side around quality, experienced players which I think you need a spine of for your young players to play around. "I am taking part in the cricket review in October and the members' forum after that. I shall prepare for that - there is no doubt about that. And hopefully what I and the other coaches bring to the table will help us move forward." "I can't remember exactly when I first went to Grace Road. The match itself, in any case, was largely immaterial as I spent most of it with bat and tennis ball in the patch of grass at the Bennett End. But no-one doubted cricket in Leicester was first class. A glance towards David Gower at the crease confirmed that. Grace Road was the local Lord's. "In 1996 I was working for BBC local radio when Leicestershire won the County Championship. That era had stars - West Indian Phil Simmons for one - but was fuelled by an underdog's drive and team unity. "For supporters now, even the opportunity to humorously goad ex-players is losing appeal. There are too many of them. The lure of Trent Bridge is understood, if mocked. But local boy Shiv Thakor is going to Derbyshire, big-hitting Josh Cobb is leaving for Northamptonshire. 'Regional also rans' is a very tough status for my generation to stomach. The club stands for far more than that." "It is never easy to leave your home county but my reasons are that things haven't worked out as well as I would have hoped in the last couple of years. "Leicestershire are going through a rebuilding phase - both on and off the field - and I felt I need to be somewhere where they had an established programme in place. "I really wanted to make a push to play for England and I want go somewhere that will give me an opportunity me to do so and has a structure in place immediately. "I feel Derbyshire have that - they have done a wonderful job in rebuilding and I hope Leicestershire can. Derbyshire seems the best option. It's a fresh start and that's a big thing. It's a new environment where I can thrive." "We are not the only club going through a difficult time and I am sure we will get through it and it's not for the want of trying. "There are always challenges here. It is a difficult business to run. My successor will have to work very hard to ensure we keep the ship afloat. In their 16 County Championship matches this season, Leicestershire did not manage to take 20 wickets in any of them. "Clearly there are issues but I don't think there are serious problems. We have issues on the playing side as everybody can see but structurally I think we are OK.
"For the last two seasons our overseas players have not played many games for us, either through injury or international commitments. "We have to make sure we sign a really good overseas players - probably a bowler who will get plenty of wickets." "It is all about finance. Players want to be playing Division One cricket and getting themselves into the minds of the selectors. "I don't think there is an issue with coaching because lots of counties are interested in taking Leicestershire's young players, so they are clearly producing them. "After 2011 when they won the Twenty20 Cup, the playing budget was reduced to make the club stay afloat. The club were in a bit of a mess and had to get back onto a secure financial footing. Out of that side they lost Paul Nixon, Paul Henderson, Will Jefferson, James Taylor, Harry Gurney and Andrew McDonald. "When you rip a side apart like that it will have a detrimental effect." "No wins, six draws, and 10 very heavy defeats in the County Championship is clearly unacceptable for a county of Leicestershire's cricketing heritage, the more so because it is a second consecutive season without a victory. "But what makes it as frustrating as it is disappointing is that it wouldn't have taken much for it to have been a much more encouraging season. "In the interests of balance, a few facts should be acknowledged. The county finished with 108 points, compared to 79 in 2013. They finished with 78 bonus points (36 batting, 42 bowling), compared to 55 (23, 32) in 2013. That is more bonus points than five of the other teams in Division Two. Leicestershire have only secured maximum batting points three times in 16 County Championship matches this season. "But even after the first three games of the season, in each of which the Foxes had the better of a drawn game, it was very clear they lacked a strike bowler and would struggle to take 20 wickets in a match. In the event, they never did. Nathan Buck bowled wonderfully to take 42 wickets. Charlie Shreck took the same number, and defied his 36 years by bowling 560 overs. "The biggest problem was they were stuck with West Indian batsman Ramnaresh Sarwan as the overseas player. A fine batsman and a lovely chap, but Sarwan arrived in England suffering from a chronic back condition, and was either unavailable, or when he did play (in just five matches), clearly unfit. "A fit overseas bowler of the calibre of Clint McKay, whom the county have signed for next season, would have carried them over the winning line in some of those early games. It would also have meant some of the young talent may not have been looking to move on."